A hybrid mortgage combines features from fixed-rate and adjustable-rate mortgages, offering borrowers greater flexibility. A hybrid mortgage, sometimes known as a laddered mortgage, lets borrowers lock in part of their home loan at a higher fixed interest rate and part at a lower variable interest rate, essentially splitting the mortgage in two. If the variable interest rate increases, the fixed-rate portion of the loan acts as a cushion against higher costs. Meanwhile, if the variable interest rate decreases, it will help offset the costs of the higher fixed interest rate. 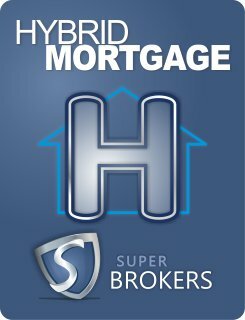 What are the benefits of a hybrid mortgage? The greatest benefit of a hybrid mortgage is not having to decide on either a fixed-rate or adjustable-rate mortgage, since you'll be receiving both. This allows borrowers to take advantage of each type without having to forego the other. If rates are low, a hybrid mortgage can benefit a borrower with its variable rate component while also protecting against future rate increases with its fixed-rate component. Hybrid mortgages also let borrowers stagger their renewal dates, limiting the chances for interest rate increases. These types of home loans also allow for different amortization and payment schedules for each component, giving borrowers greater flexibility in how much they pay each month, as well as affording them the chance to pay off their mortgage faster. 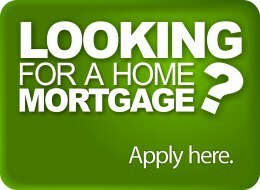 How do I get a hybrid mortgage? 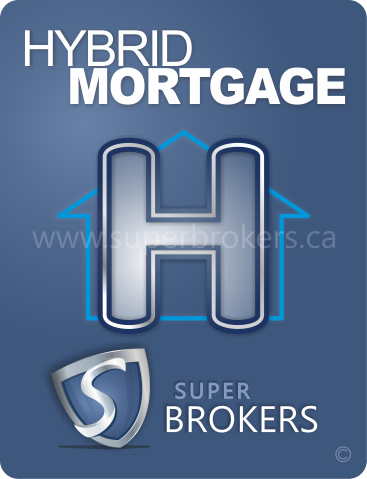 Contact Super Brokers to speak with a mortgage professional who can help you decide if a hybrid mortgage suits your needs. When choosing a mortgage that features changes in interest rates, it's important to fully understand what you're getting into. Keep in mind that the minimum down payment is 5 percent and the maximum amortization is 25 years.